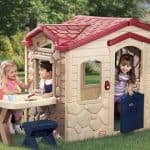 An incredibly versatile playhouse with unique design and layout, offering three different areas in which to play. With fantastic attention to detail and even a fabric curtain, this playhouse offers flexibility, design and features for your child and their friends to enjoy. Suggest from age 2 plus. This is an excellently sized children’s playhouse constructed from plastic which is anti-UV meaning they will retain their colour for years. It has great inside space and there are three superb areas for the children to play in, a house, a garden and even a greenhouse! The playhouse features two doors, two windows with shutters and even a fabric curtain and there is a divine stable door entrance. This is suitable for even the tiny ones and we suggest from age 2 plus. This product isn’t designed like a traditional playhouse, in fact there isn’t much ‘house’ space to be seen, but the two ‘porches’ open to the outside are a fantastic design for imaginative play. The attention to detail with the different textures on the walls and roofing and even a real fabric curtain inside make you feel like this is a well-thought out playhouse for many hours of fun. Smoby Floralie Playhouse: How safe is it? As with all Smoby playhouses this particular playhouse rates very highly on the safety scale. As a French company, all Smoby’s products meet EU standards and regulation so you can be sure that you are purchasing a high quality item. As this house is slightly different and unique in terms of design and features, we want to see whether this particular playhouse poses any potential safety issues for your child. Below we discuss the different aspects of the playhouse and how they could pose and particular safety concerns during use. Overall: The playhouse is a fantastic design for parents wanting to keep an eye on their child whilst they are playing inside. With many open areas, it is practical for parents as well as being a fun design for the child. Windows: This playhouse features two windows that open and close with a singular motion. The windows have a small handle, making it easy for child to operate without worrying about trapping their fingers. The front window is also high and just the right size, slowing children to look out but not low enough for them to attempt to climb through. 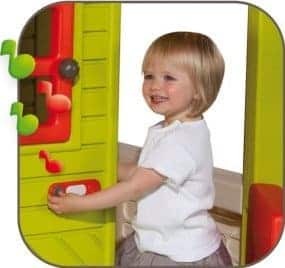 Doors: There are two doors, front and back, in a stable door design with an easy grip for ease of opening from the top, causing no concern for safety. Accessories: The only real interior accessory is the fabric curtain, a lovely addition, and one not seen on other playhouses. The curtain is fabric and short, therefore posing no risk of getting caught up in it. 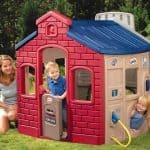 Overall, a fantastic design for a playhouse that proves that you can have a safe playhouse with many features. 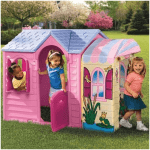 Smoby Floralie Playhouse: How easy to build? 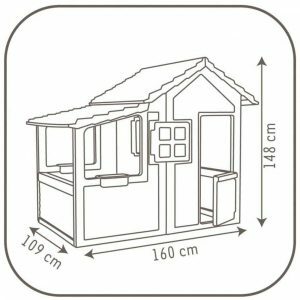 The Smoby playhouse range uses the slot-click-tighten model for construction and this particular playhouse is no different. The process is very simple, even for someone who has never constructed anything of this nature before. All the major pieces slot and click together; following this the screws provided simply need tightening to ensure a sturdy build. 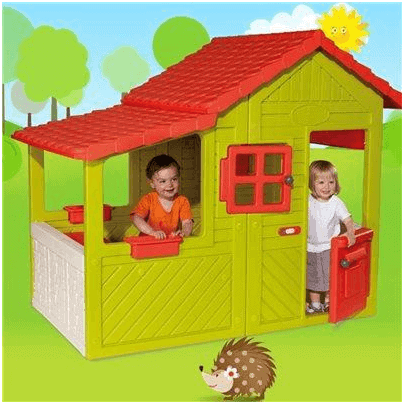 Overall, this playhouse is very easy to assemble and will be standing in your garden within half an hour of opening the box. If you run into trouble then just consult the instruction manual which is provided in a number of languages to ensure accessibility for everyone. 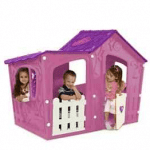 Smoby Floralie Playhouse: What is the overall quality like? Smoby are a French toy manufacturing company, providing high quality, educational and imaginative toys to children in Europe and beyond. 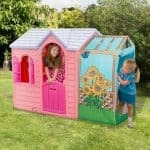 Overall, the team at whatshed.co.uk were very impressed with this playhouse. The design is fantastic, providing a unique layout involving three separate areas for maximum enjoyment and fun to be had. The construction has a very sturdy feel and the thick plastic makes it hardwearing, withstanding even the harshest of weathers and the roughest of treatments. The UV resistant coating means that the colour will be just as vibrant in five years’ time as it is today. The attention to detail is fantastic – what a lovely addition to the playhouse to have a real fabric, working curtain. We also love the double porch feature at either side of the main house, what a joy to be able to enjoy the fresh air from the comfort of your playhouse. Age range: 18 months to 6 years old. A well-thought out playhouse with a unique, triple-aspect design for small children to enjoy by themselves or with friends. 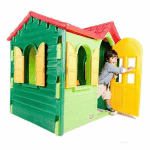 The interior of the playhouse is maybe smaller than most but if you are looking for a house with different areas, particularly outside areas, this may be the right playhouse for you. At the higher end of the playhouse price range, this house rates highly for its design and curtain feature, providing great value for money. As soon as we had our second child, we decided that we would get a playhouse which our children would love to play with. So we bought this one and I must say that even I want to play in it. The house is ornamented with such rich vibrant colors that our children just simply smile looking at it. And not to worry about the colors fading away because they are UV protected. The two doors and two windows help me to keep an eye on them from outside. And the best part is, with separated play area within the house, each of our children can play without disturbing each other. The price was also within our budget. In all it was a very good decision to buy this one.